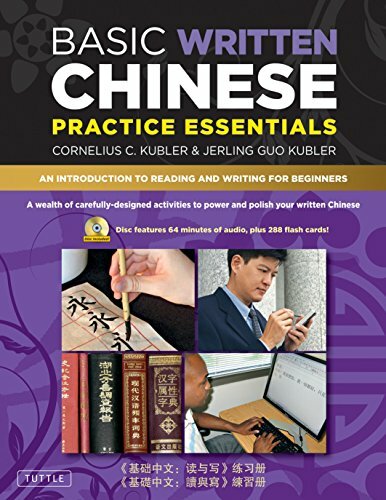 [PDF] Basic Written Chinese Practice Essentials: An Introduction to Reading and Writing for Beginners (MP3 Audio CD and Printable Flash Cards Included) | Free eBooks Download - EBOOKEE! Description: Use this one-of-a-kind practice guide and Chinese workbook together with any Chinese book or language program, and dramatically enhance your speaking. No matter what book or course you're using to learn Chinese, it takes a lot of practice. Here is a wealth of effective practice activities to help polish your written Chinese. This book corresponds to Basic Written Chinese and allows you to move from complete beginner level to basic proficiency. An included disc contains extensive audio material, as well as (printable) flash cards. Practice Essentials includes carefully designed activities to help solidify every aspect of your spoken Chinese skills, including: Chinese character practice sheets. Dictation, fillâ€“inâ€“theâ€“blank, dialog completion. Answering questions, map reading, converting written style to spoken style. Identify radicals and phonetics punctuating sentences. Written tasks based on realia like schedule, photographs, and name cards. Translation exercises. The corresponding MP3 audio CD includes: 64 minutes of nativeâ€“speaker audio. 288 printable flash cards. Together with this book, you can use the Basic Spoken Chinese series if you want to learn fluent spoken Mandarin. About the Series: Respected Chinese language expert Dr. Cornelius Kubler, who has taught diplomats, business people and students, presents a learning system that uses separate but integrated "tracks" to help you efficiently master the basics of spoken and written Chinese. The materials in Basic Spoken Chinese allow you to move from complete beginner level to basic fluency. No comments for "[PDF] Basic Written Chinese Practice Essentials: An Introduction to Reading and Writing for Beginners (MP3 Audio CD and Printable Flash Cards Included)".